Looking for a whole bunch of rustic goodness at a sweet price?! Then I’ve got the pack for you! 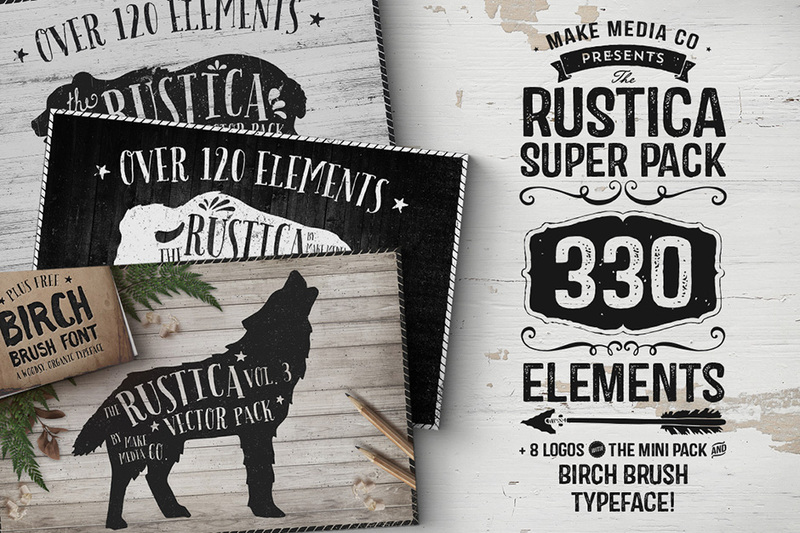 This new bundle includes more than 330 unique vectors (almost double that with mirrored vectors), 8 typographic logos, the Birch Brush Typeface, 1 bonus texture, 1 bonus brush and the Rustica Mini Pack (with over 40 additional illustrations)! Now, that’s one sweet deal! 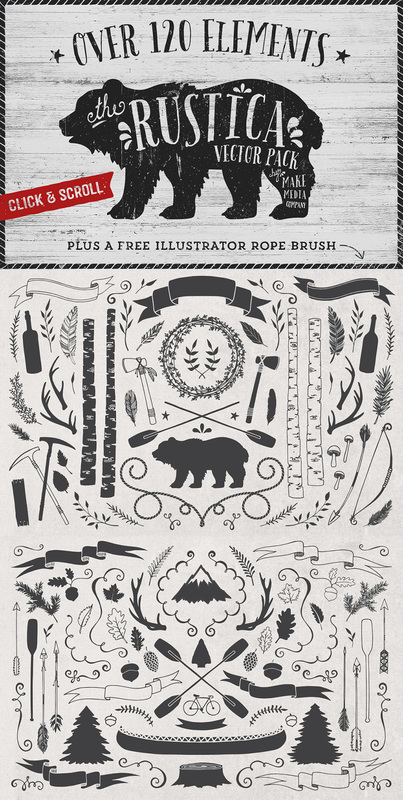 • Over 330 unique, hand-drawn vector elements (No duplicates counted). • 1 Subtle Vector Texture in 2 colors (Found in the ‘Logos’.AI file). • 1 Rope Brush Pattern (Just drag graphic to brushes panel. Instructions included). • 8 ready-made logos with editable text (Illustrator only). • Bonus Mini Rustica Mini Pack with over 40 items. File size is approx 29.5MB (58.3MB unzipped), offered as a single download. Hey There! Love this but I may have goofed up… how exactly do I use it on Photoshop? Thanks bunches! Thanks so much for your comment Susan! I’m really sorry for any confusion caused by the compatibility of the Rustica Super Pack. The designer has advised that this pack is mainly for Illustrator, as the ready made logos and bonus rope brush are only compatible with Illustrator. The designer has also included PNG files for their graphic elements which will work in Photoshop so I hope that you do still find this pack useful Susan. If you feel that these are not helpful for your particular projects, please let us know within 30 days of your purchase and we will happily refund you in full!